While the 2018 results were slightly lower than expected, 2019 distribution guidance was also softer than Deutsche Bank forecast. Morgan Stanley upgrades to Overweight from Equal-weight, in view of the recent underperformance in the stock and the value relative to global listed airports, as well as Australian infrastructure stocks. December traffic data revealed international growth of 3.7% while domestic was down -2.6%. Macquarie notes the earnings outlook continues to be clouded by a softening of international capacity growth. The Productivity Commission review in the next nine months resets the focus to the threat around regulatory intervention, Macquarie observes. Submissions are taking a similar approach to previous reviews, with the airports supporting the current regime and airlines arguing for a more credible threat of “final offer” arbitration. It is unclear how Sydney’s Airport’s 8% first half earnings growth fared against the broker’s forecast, other than "performing well". FY guidance for 9% growth is reaffirmed. Growth was achieved on flat aircraft movements, the broker notes, which is helpful to the longer term capacity outlook. International passenger growth is running at above long-term trend rates in the first half, up 5.2%. Domestic passenger growth is 2.1%. Morgans forecasts an 8% increase in revenue for the first half that should generate around a 9% increase in operating earnings. Macquarie believes April traffic statistics are somewhat misleading as a capture movements of Easter and school holidays. Ord Minnett considers Sydney Airport offers exposure to an attractive asset class with high barriers to entry and an end market that has demonstrated resilient growth. The broker initiates coverage with a Buy rating and $8.45 target. December passenger numbers showed strong international growth and Morgans expects 11% growth in net operating receipts in 2017. Over the next three years the broker expects 6% per annum compound growth in cash flows. For the six months to June aeronautical revenue grew by 9% off 3.6% growth in traffic, because of the favourable shift in mix to international versus domestic. UBS now forecasts cash flow growth of 14% in 2017 and EBITDA growth of 10%. Morgan Stanley observes rolling 12-month international passenger growth was around 8.0% and domestic passenger growth up 1.9% in May. Two factors underpin Morgans’ decision to upgrade to Add from Hold. First comes the share price slump. Then follows the assumption Sydney Airport will not participate in the development of a second airport at Badgerys Creek, at least not under the conditions proposed. The surprise aspect for Morgans in the Commonwealth government’s notice on the second Sydney airport was that SYD is required to fund all the construction costs without any federal funding or cost protections. Sydney Airport (SYD) has been placed in a quandary after the Commonwealth government set out the terms for development of the second Sydney airport at Badgery’s Creek in its notice of intention (NOI). The main change to expectations is that there is no federal funding involved in the NOI, placing the investment decision squarely on SYD, which has first right of refusal. Today we are applying a Bull Call spread on Sydney Airport Holdings Ltd (SYD), which has broken resistance and showing bullish entry signals. Will A Second Sydney Airport Hurt SYD Shareholders? Sydney’s monopoly airport is about to get some competition – how will that affect shareholders? Passenger growth continued strongly in the March quarter but, looking into the second quarter, Macquarie suspects the domestic environment is changing and somewhat uncertain, given the recent comments from Qantas ((QAN)) to cut domestic capacity. Sydney Airport remains the obvious candidate to secure Sydney’s second airport and the broker sees this as a positive growth opportunity. Yesterday saw the release of the Environmental Impact Study, which the broker suggests held no surprises. Sydney Airport continues to post solid monthly traffic numbers, and the broker sees more growth ahead. The company will also benefit from the T3 acquisition and the aero-pricing agreement. Sydney Airport Holdings (SYD) posted a first half result that pleased brokers. Yield has expanded on the back of prior investment in the airport and international passenger growth is on the rise, supported by a number of new wide-body services which will commence operations in the second half. Negotiations with BARA have led to a favourable outcome, suggest the analysts. Assuming both Qantas ((QAN)) and Virgin Australia ((VAH)) agree to similar terms, Morgan is foreseeing five years of above inflation growth for Sydney Airport. Sydney Airport Holdings (SYD) is expected to improve passenger experiences, with a brand new agreement on aeronautical pricing. The new agreement provides greater certainty as it is underpinned by a fixed pricing path and incorporates capital expenditure over the five-year period, enabling the airport to invest in its terminals and technology and improve services. This contrasts with previous agreements in which capital expenditure was agreed separately with airlines and charges re-set every couple of years. The partnership announced by Qantas ((QAN)) with American Airlines bodes well for Sydney Airport, in Morgans’ view. Seat capacity between Sydney and the US is expected to increase by 301,000 per year. Sep Q traffic stats showed a decline in international of 0.2%, the first decline since the June Q 2009. Domestic rose 1.0%. Airline discipline with regard capacity is largely to blame, the broker suggests, but while international weakness was thus no surprise, the magnitude was more than the broker had forecast. With Ebola cases now reported in the US and Europe, the broker weighs up the potential impact on Sydney Airport earnings. The last such outbreak episode was SARS in FY03, which saw international traffic drop by 6-7%. The impact was nevertheless brief, and SYD is far less leveraged than it was then, the broker notes. International traffic was strong in May, supported by ongoing growth from Chinese passengers and additional frequencies from some Asian carriers. CIMB remains confident in the outlook but maintains a cautious view based on valuation. March traffic statistics reflected the late timing of Easter and the company recorded a flat result in the month. Domestic traffic remains sluggish but the broker expects international traffic will be supported by new capacity and services. Sydney Airport has announced a 7.3% increase in earnings before interest, tax, depreciation and amortisation to $910 million from $848 million previously. The result was ahead of the market’s expectations which centred on EBITDA of $895 million. 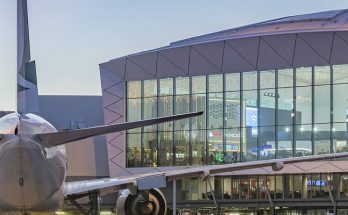 Post Sydney Airport’s investor day, the broker has slightly increased its dividend expectation due an increased cashflow expectation. The broker remains restricted in making a recommendation. Macquarie ((MQG)) will divest its stake (17%) via an in specie distribution to shareholders. This was widely expected and does not alter CIMB’s view of Sydney Airport. The broker is bullish on the outlook, with international traffic growth expected to sustain its strength into the new year. Sydney Airport reported international traffic moderated in September while domestic declined for the first time since May 2012. The broker remains confident there is more upside for Sydney Airport. The stock is trading at the best yield in the sector, at 6% FY14 forecast earnings. Sydney Airport has had a strong run with international traffic growth while the domestic rate has eased. CIMB is starting to see upside risks to forecasts as international traffic has climbed to 4.1% year to date. The airport’s international traffic grew 5.6% in August while domestic was up 1.0%. CIMB argues that simplifying the corporate structure and settling the ATO tax dispute, has made SYD now a more attractive investment opportunity for potential investors. The broker talks about a "robust" growth outlook. Sydney Airport ((SYD)) is unlikely to find clear air until its tax issues are resolved. According to CIMB this will overhang the stock in FY13 even though the outlook for traffic growth is solid. CIMB estimates the worst case scenario could cost the company up to 7c per share in annual cash flow. Other than that, forecasts are holding up and CIMB has kept a Hold rating with a price target of $3.47.